"IoT Market Prediction For Unlocking Opportunities"
"How And Why Should U Go For Node.js As Your Backend"
2018 is a year full of surprises, and we have seen advancement and changes occurring in e-commerce, as well. Artificial Intelligence is really taking over the world. AI is everywhere now, particularly in the eCommerce sector. And this article is focusing on four leading e-commerce firms and their use of AI. “Artificial intelligence will revolutionize how businesses compete and grow, representing an entirely new factor of production that can ignite corporate profitability,” said Paul Daugherty, chief technology & innovation officer, Accenture. A study by Gartner reveals that “by 2020, 85% of their customer relationship with the enterprise will be managed by Artificial Intelligence”. That means, AI has taken the whole industry sector under its influence and makes the e-commerce industry smarter to predict the trends and enhance the customer experience. 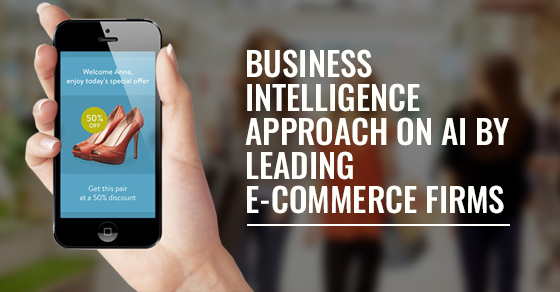 So, let's have a look at how leading e-commerce firms take advantage of AI in reshaping the e-commerce journey. “At Amazon, we’ve been engaged in the practical application of machine learning for many years now. Some of this work is highly visible: our autonomous Prime air delivery drones; the Amazon Go convenience store that uses machine vision to eliminate checkout lines; and Alexa, our cloud-based AI assistant. But much of what we do with machine learning happens beneath the surface. Machine learning drives our algorithms for demand forecasting, product search ranking, product and deals recommendations, merchandising placements, fraud detection, translations, and much more. Though less visible, much of the impact of machine learning will be of this type – quietly but meaningfully improving core operations.” – Jeff Bezos, Amazon CEO. “We apply machine learning techniques to item-to-product matching, price prediction and item categorization tasks on eBay. We also employ them for attribute extraction, generating the proper names of browse nodes, filtering product reviews and more. Machine learning helps us to optimize the relevance of shopper’s search and navigation experiences.” – Selcuk Kopru, eBay Research Scientist. “Online shopping will become more emotional. The companies who will win will not only unlock artificial intelligence but do it in partnership with emotional intelligence.” - Bradford Shellhammer, eBay Head of Personalization & Engagement. “Artificial intelligence will automate many aspects of e-commerce through programmatic selling. Deep learning will help sellers create better listings to maximize returns and give buyers the information they need.” - Uwe Mayer, eBay Senior Data Scientist. “We’re essentially creating a bridge where we are enhancing the shopping experience through machine learning. We want to make sure there is a seamless experience between what customers do online and what they do in our stores.”- Lauren Desegur, VP of customer experience engineering at Walmart Labs. Speaking at the Re-Work Deep Learning in Retail & Advertising Summit, in London, Alessandro Magnani, the data scientist at Walmart Labs said: “We heavily use machine learning in product recommendation. According to Magnani’s comments, Walmart is a big proponent of artificial intelligence and machine learning, as well as deep learning. “AI is the digital infrastructure allowing the platforms” - John O'Loghlen, director of business development, Australia and New Zealand for Alibaba Group. “In fact, Alibaba has put artificial intelligence at the center of our e-commerce operations, helping to guide consumers through their ‘customer journey’, from product discovery to product purchase and product delivery,” he continued. All in all, AI is on the ascent in the e-commerce industry, nonetheless, it is still a long way from being great. Artificial Intelligence in e-commerce will affect exchanges, client retention, fulfillment, productivity, and substantially more. AI is changing the manner in which we purchase and sell through online. By capitalizing on AI-fueled tools such as virtual assistants or chatbots, your online store can effectively meet the ever-increasing needs of digitally-savvy buyers. In an interview, eBay’s chief data officer Zoher Karu suggests that small and mid-sized businesses should organize their data around their customers in order to gain real business value. Regardless of whether you possess a web design agency or an e-commerce store, AI is something which can assist purchasers with making better choices by identifying their search patterns, product preferences and buying behavior while providing them with the right products. This enables brands to make a more superb customer experience which will, in the long run, enable you to make a positive brand image and a monstrous steadfast fan base. However, AI is at the heart of e-commerce operations. And that should matter to marketers who want to make better ROI.